I dream of pancakes. Literally. I dream of all flavors: buttermilk, blueberry, chocolate chip, Bananas Foster, peanut butter and jelly, bacon-maple. I can totally emulate Bubba Blue from Forrest Gump and name off more combinations, but I’m sure you get the picture. 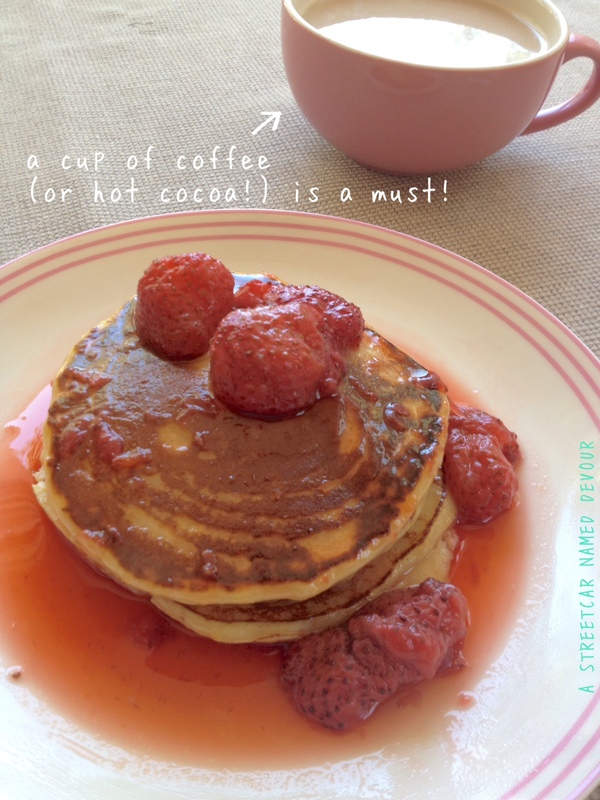 I woke up one morning with the instant craving for oatmeal pancakes. Oatmeal is always in my pantry. And because I love me some strawberries (and they’re perfectly in season right now) I topped ’em with a strawberry compote. Prepare the wet ingredients. Place the oats with water and a pinch of salt in a small bowl and microwave for 60 seconds or until cooked. In the same bowl, add the melted (but slightly cooled) butter, milk, honey and egg. Mix till well incorporated. Prepare the dry ingredients. In a medium-sized bowl whisk all of the dry ingredients together. Using a rubber spatula, slowly and gently fold in the WET ingredients into the DRY ingredients. I always get asked by friends why their pancakes are always flat. The trick here is not to over-mix the batter. It’s perfectly OK to have flour clumps in the batter, you want a thick consistency. Get it? Got it? Good! Heat a cast-iron skillet or non-stick pan over medium heat, butter the pan and when hot, use a 1/4 cup to scoop the batter and pour into the pan. Because there is a fair amount of oatmeal clumps in the batter, it may be hard to see the tiny bubbles that form on the sides of the pancake, indicating it’s ready to turn over. In this case, using a spatula gently lift the pancake and check to see if it’s golden brown and “flippable.” If you’re forcing the spatula on the pan to scrape it out, stop. Leave it be for another minute or two. 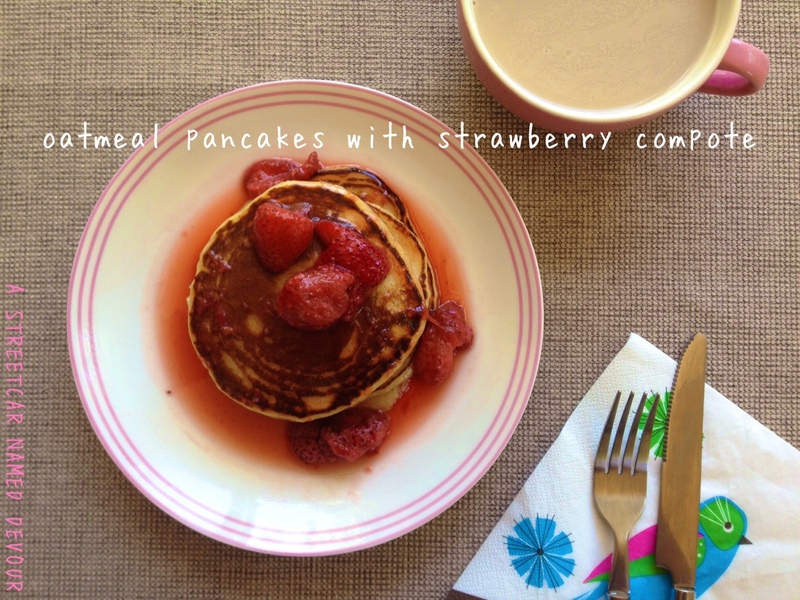 When you start to see the bubbles start to form, sprinkle a small handful of the fresh strawberries onto the pancake. Then when the pancake gets to a golden brown color, flip it onto the side. This should take a total of 5 minutes. Watch your heat, though, to avoid burning the pancake. Continue scooping 1/4 cups of batter into the butter-greased pan till all batter has been cooked off. Place all of your ingredients in a medium-size saucepan and bring to a boil over medium-high heat. Reduce the heat to low and simmer for 10 minutes. Remove the vanilla bean and serve warm. I’m a huge sucker for pancakes. If it’s not oatmeal I’m eating for breakfast, pancakes are the perfect substitute. And these seem to have the best of both worlds 🙂 they look so yummy and can’t wait to try! I WOULD GLADLY HACER WITH THIS DISH OF PANKEKES! IT HAS BACKGROUND.